The Maldives has a lot of stunning beauty and the resorts there put a lot of thought into how to experience that beauty most completely. 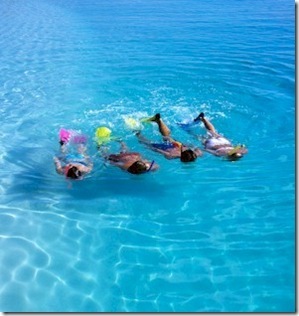 The heart of the beauty is the distinctive ocean waters dappled with a crowded palette of blue hues. The best resort restaurants get the guests as close to the waters edge as possible with waterside beach dining a crowd favourite. Others have pushed out even further onto the water (with the dramatic instance of Congrad Rangali pushing ‘into’ the water) with pavilions. 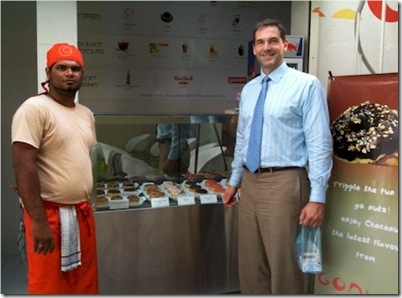 I have visited the water pavilion restaurants at Kuramathi, Rangali and Reeth Beach, and they are quite prevalent across the Maldives. Other resorts are now moving to ‘altitude’ to enhance the vista for its diners even higher. Four Seasons Landaa Giraavaru’s Moroccan restaurant ‘Al Barakat’, Adaaran Vadoo’s main bar, Anantara Kihava’s upcoming Sky-Fire-Salt-Sea restaurant concept all elevate the dining to a second story for a broader perspective on the surrounding maritime spectacle. But Sakis makes a dazzling case (and photos as expected) for Baros’ Lighthouse restaurant calling out the distinguished architecture and menu in the increasingly competitive category of panoramic pavilions. The ‘Big 5’ represented the ‘main events’ on safari. Yes, the colourful birds, curious critters, adorable primates were all wonderful to behold, but these Big 5 had a certain cachet and thrill. It became a bit of a signature to a great safari to see all five. But actually, on reflection, they break into two groups – treats and rarities. 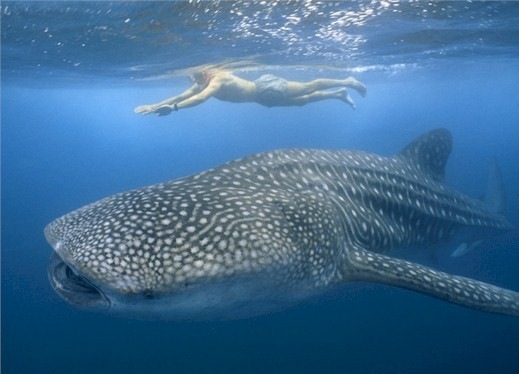 The ‘treats’ are the ones that you would pretty much hope or even expect to see at least one of on any good snorkel…but are still a special treat. The ‘rarities’ are the ones that one hardly ever sees snorkelling, but can especially if one seeks them out. This list is a distinctly Indian Ocean / Maldives list. In the same way that the ‘Big 5’ was distinctly ‘African’. Tigers, orangatangs, and sloths would certainly figure into any one’s top aspirations in Asia jungles. Similarly, the dugongs of Australia, water snakes of Indonesia and seashores of Europe and America make for special occasions in those locales. 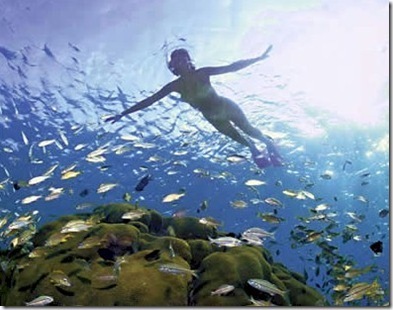 One of the common questions on the Maldives Trip Advisor Forum is where to stay for a quick Male stop-over. If you are going for the sheer mathematics of convenience, then the closest hotel/resort to the Male airport is Hulhule. 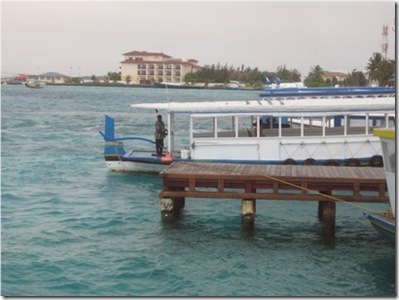 The picture above shows the hotel snapped from the water taxi ranks in front of the airport. I strolled the few hundred yards of waterside in a few minutes to check it out during one of my many transits out of Male during my recent tour. 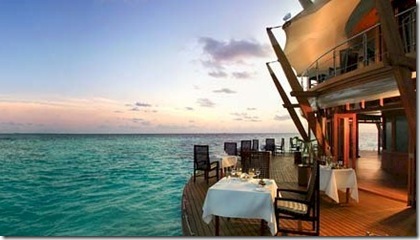 Some people dismiss Hulhule as a weaker offering relative to the dedicated resorts sprinkled across the atolls. But compared to ‘airport hotels’ around the world, Hulhule re-defines the genre. Instead of being tucked into some industrial park, the hotel is surrounded by water. Instead of being an empty guest warehouse, it actually has invested in extensive entertainment facilities including basketball, archery, pitch-and-putt golf, one of the largest and best equipped fitness centres I have seen and a fine pool. When I came upon the Haveeru Online piece on ‘Gonuts’ (“International doughnuts cafe chain opens in Maldives”) I nearly fainted with anticipation. Okay, it wasn’t Krispy Kreme. But doughnuts and the Maldives. It’s like ambrosia and paradise mixed into one indolent concoction. So on my recent trip, I had to make a special detour to check out Gonuts. Despite my discerning palette for all things doughy and fried, I was beside myself when I got to experience them. First, they were good. I had the ‘Chocolate Profiterole’. It appeared to be made fresh as I waited. The filling was particularly ‘creamy’ as opposed to the more gelatinous custard of conventional donuts. Second, they were appropriately exotic. Flavours offer took the doughnut repertoire to whole new dimensions. ‘Spicy Tuna’ and ‘Sambalicious’ (with chilli pepper) were too adventurous for me even. Finally, the dining area was a masterstroke. One of my pet peeves with resorts is when they pave over too many dining areas and don’t have enough ‘toes in the white sand’ places to eat. 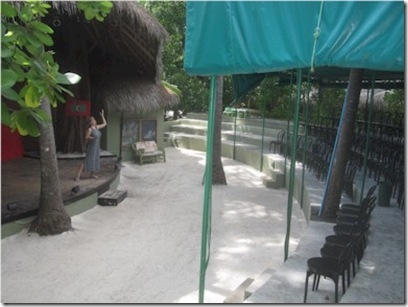 And yet, here in the heart of downtown Male, Gonuts’ own dining area was laid out with white sand for people to enjoy their delicacy in a delightful cafe setting. So why do I credit the Holiday Inn Male with this ‘Best of Maldives’ distinction? Well, Gonuts has a take-away service! Which means that guest at the Holiday Inn (a few blocks down the road) can ring up for a few concoctions to enjoy with their mocktail by the roof side pool. Everyone talks about the Maldive seascape, but despite lacking in size, the Maldive landscapes are often just as striking in their colour and beauty. Most resorts work hard to bring out the very best with primping and fussing over bougainvillea, hibiscus, and oleander lining the pathways and accents around the island. But the winner of the blue ribbon for gardening has to go to Adaaran Vadoo. Vadoo’s garden is one of the first things to hit you on arrival. Leaving the jetty, you emerge through a gate into a manicured horticultural masterpiece like stepping into some sequestered Eden. 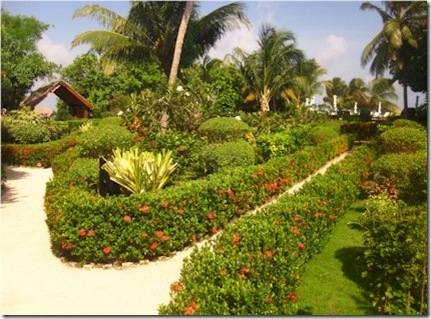 Passing through reception to the rest of the island brings you to an even more expansive park with flowers, topiary, paths, little sitting areas, ‘turtle sanctuary’, etc. 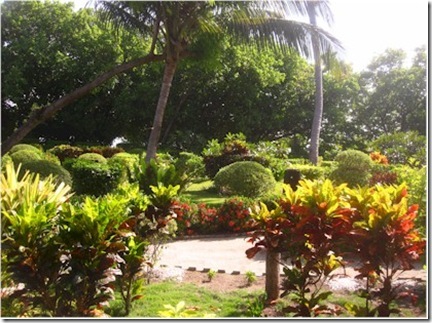 Not only are the gardens exquisite, but they are also the dominant feature of the island itself. Being one of the smallest islands in the Maldives line-up, there is no room for even any villas (so they have 100% water villas). What little space exists is devoted more to blooms and blossoms than any other island. 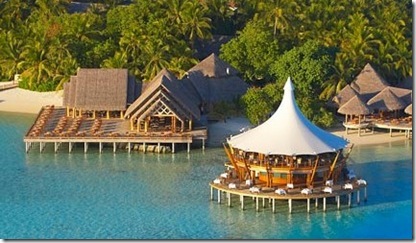 A rich tropical forest tapestry blankets Adaaran Hudhuranfushi with a colourful and quirky canopy. The sand paths have a grander arboreal arch to them than most islands. And the diversity is stunning. There are several giant Banyans around the resort. Our favourite was the ‘Kasakue’ or ‘Screw Pine’ (see picture above). 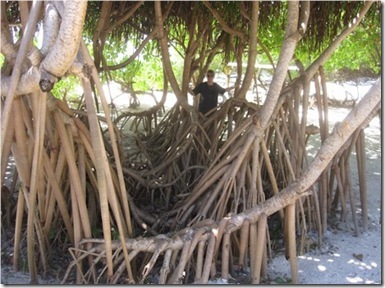 We see these all over the Maldives with their bizarre root systems reaching down into the sand giving rise to their nickname – ‘Walking Trees’. 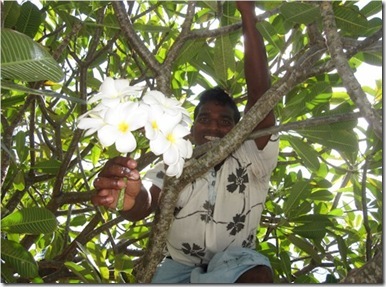 Being one of our favourite tree, we keep an eye out to them and some of the best examples we saw at Hudhuranfushi. 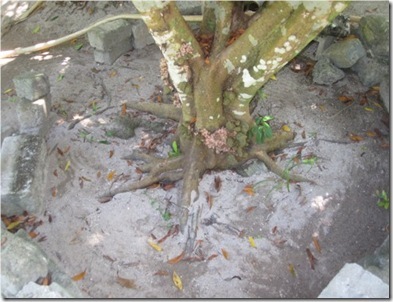 Another place where they had great selection was their resort garden (one of the biggest in the Maldives) where they features unusual specimens like the ‘Num Num’ tree which produces a fruit at the base of its trunk used for traditional cooking (see picture at bottom). A very appropriate name for a delicacy producing tree I’d say. 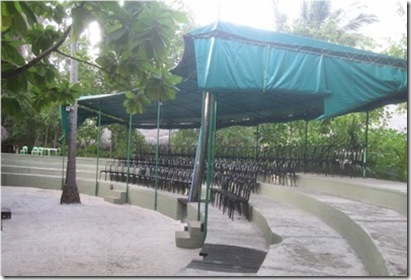 Hudhuranfushi also has it’s own Banana Grove that features 7 different varieties of bananas. My wife’s favourite was the abundant ‘Temple Trees’ that bloom all year round with white and yellow flowers (see picture directly below). They are called ‘Temple Trees’ because worshippers would pick the flowers and take them to temples as a part of Buddhist tradition in the region. I’m not going out on a limb to say if you appreciate the bio-diversity of a thriving tropical forest, then Hudhuranfushi is a treeat for you (I am not ashamed of these puns). 48 resorts have tennis, 11 have squash courts, and 7 have badminton courts (according to my research). 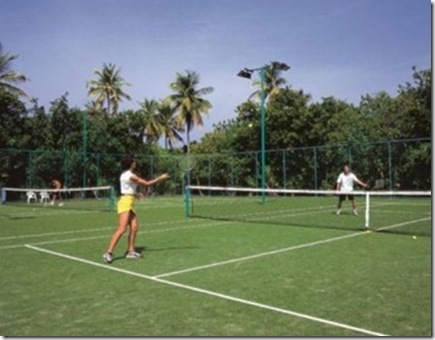 But only Reethi Beach has 2 tennis courts, and 2 squash courts and 2 badminton courts. And they are all in pristine condition. The latter two are situated in their large indoor sports complex in the centre of the island. The tennis courts are all weather surface with flood lighting. Also, the extensive indoor space becomes a hedge against any unlucky bouts of weather or just a break from an overdose of sunshine.